On the way home from a visit to Ikea at Caen this week, we stopped off at Falaise to visit the Château de Falaise. 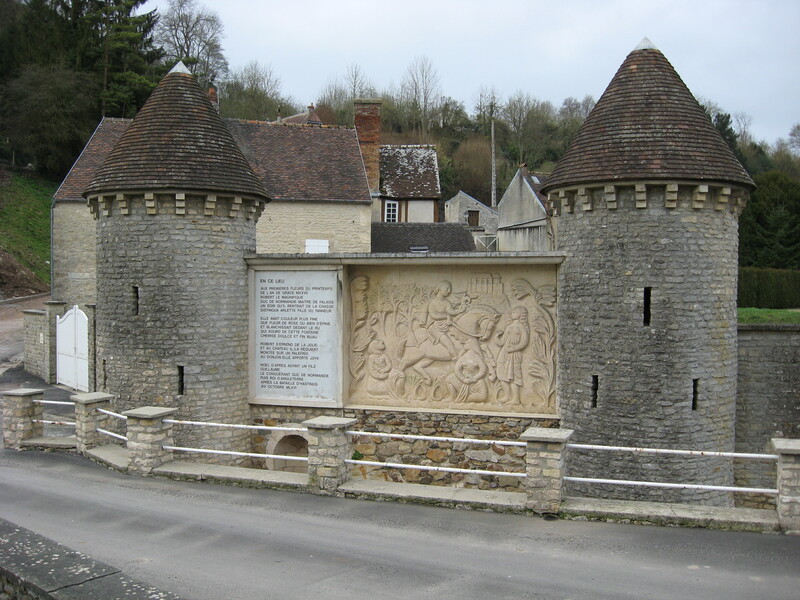 Falaise (meaning “cliff” in French) was the birthplace of William the Conqueror. The castle of Falaise overlooks the town from the high crag that the town is named after, and was the ancestral seat of the Dukes of Normandy. Access to the interior walled defences of the castle and the battlements is free, but you have to pay to enter the large and small keeps and the Talbot Tower, the round structure that dominates one corner of the site. There is a well-stocked gift shop with all sorts of medieval toys, models and games – plenty of stuff for kids of all ages. The entry fee (7.50€ 2011) includes an audioguide that switches on and off automatically as you go from room to room. We found the commentary and accompanying slideshows rather boring, with pseudo-mystical overtones. We would have preferred something more punchy that told the history of the architecture of the château, rather than blathering on about William’s supposed dreams and the legends and myths surrounding his conception and his “destiny”. From our point of view the audioguide for Mayenne Chateau is much better, and its displays more imaginative. However, the views from the top of the Talbot Tower are spectacular, giving views over the entire town of Falaise and the surrounding countryside. On the outside, but within the exterior defence walls (still under reconstruction and repair when we were there), it is easy to miss visiting the bastion that is situated behind the Visitor Centre as it is unsignposted. It appears still to be under reconstruction but is definitely open to visit, and gives some more excellent viewpoints. If visiting the castle, take a walk outside via the panoramic route – if driving this route there are a couple of parking places along the road. It gives some great views of the northern and western defensive walls, the tower and keeps way above. In the valley beneath the castle walls to the north is a cottage and large plaque and frieze marking the spot where William’s peasant mother is supposed to have been “seduced” by his father. Open every day from 10:00AM to 6:00PM. Free parking in the square near the entrance to the Château de Falaise, next to the statue of William the Conqueror, or in the car park under the southern perimeter walls. The château interior is partly wheelchair accessible thanks to lifts between floors, but not the upper levels of the Talbot Tower.